A draft of the hearing order, offered by Campbell and councillor Timothy McCarthy, notes the vast disparities between the city’s racial and gender makeup and that of its public safety agencies. “While Boston is a culturally, racially, ethnically, and linguistically diverse City, workforce demographics for our public safety agencies do not reflect the demographics of the population they serve,” the order reads. For almost two decades, Boston has been a “majority-minority” city. 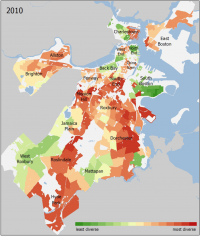 Boston Planning and Development Agency analysis of census data in 2018 determined 46.3 percent of residents are white, 22.8 percent are black, 19 percent are Hispanic, and 9.3 percent are Asian. About 37 percent of residents speak a language other than English at home. In the Boston Police Department, which includes 2,073 officers, 67 percent of them are white, 22 percent are black, 9 percent are Hispanic, and 2 percent are Asian. Of 1,511 Boston firefighters, 72 percent are white, 19 percent are black, 8 percent are Hispanic, and 0.4 percent are Asian. And of 399 EMS technicians, 68 percent are white, 13 percent are black, 7 percent are Hispanic, and 1 percent are Asian. The differences become more pronounced in leadership. The 121 Boston Police lieutenants, captains, and superintendents are 86 percent white, 12 percent black, 2 percent Hispanic, and 1 percent Asian. There are 367 Boston Fire Department deputies, district chiefs, captains, and lieutenants, 83 percent of whom are white, 12 percent are black, 5 percent are Hispanic, and none are Asian. Similarly, of 44 EMS chiefs, superintendents, captains, and lieutenants, 73 percent are white, 18 percent are black, 9 percent are Hispanic, and none are Asian. An NAACP report on Boston’s diversity seemed to find a backslide in diverse Fire Department hiring in recent years. Of the new firefighters hired during Mayor Martin Walsh’s tenure, 85 percent of them were white as of October 2017. Police and fire officials have been on the record stating the need for more diverse forces, but note built-in requirements like civil service exams and veterans’ preference, which can contribute to disproportionately white recruits. Measures like the renewed police cadet program have the potential to increase diverse recruits, proponents say. The differences in representation also extend to gender. About 52 percent of Boston residents are female, but women are only 13 percent of the city’s police officers and 7 percent of the police command staff, 1 percent of firefighters and 0.3 percent of Boston Fire command, and 32 percent of EMS technicians and 20 percent of EMS leadership.